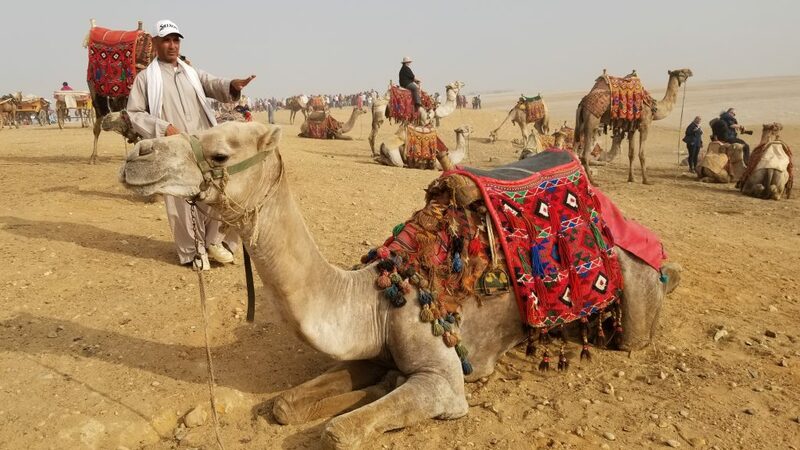 Egypt is a bucket list destination for many with good reason! This remarkable country contains the only remaining Wonder of the Ancient World. 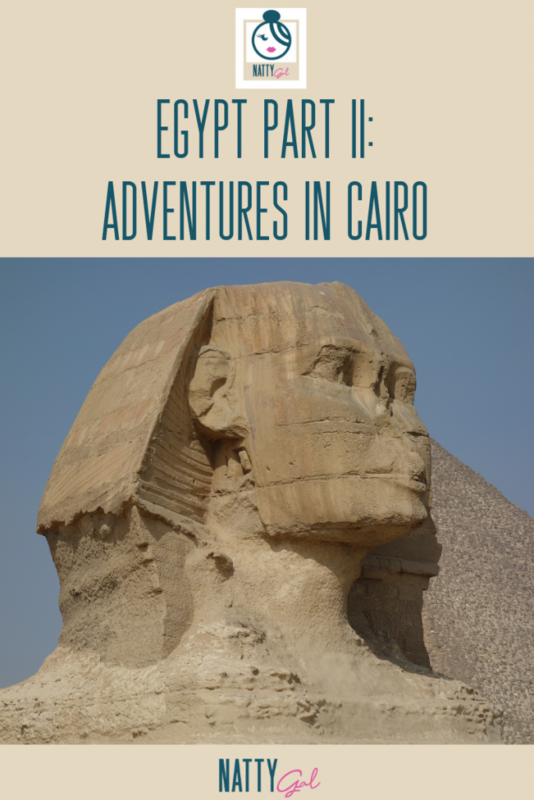 Today we focus on Cairo as Part II of the Egypt series; if you missed the first post, you can read it here. 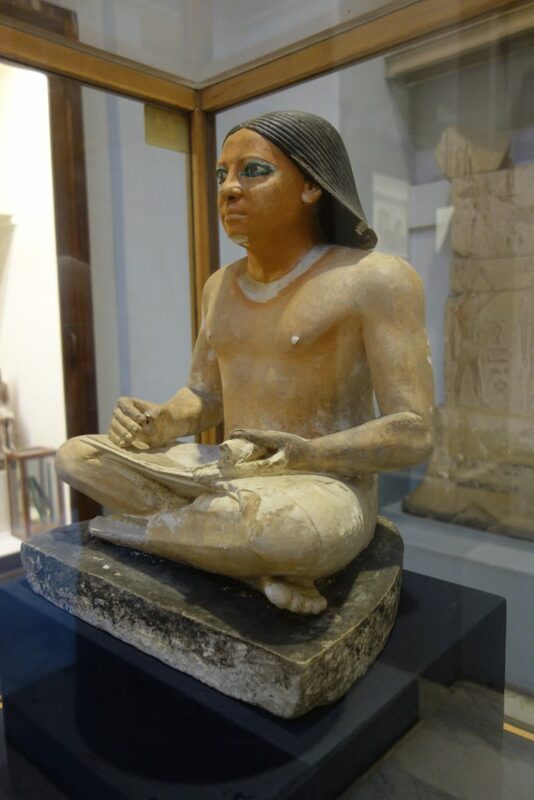 Egypt is one of the oldest civilizations in the world, with over 5000 years of history. Artifacts are amazingly well preserved. 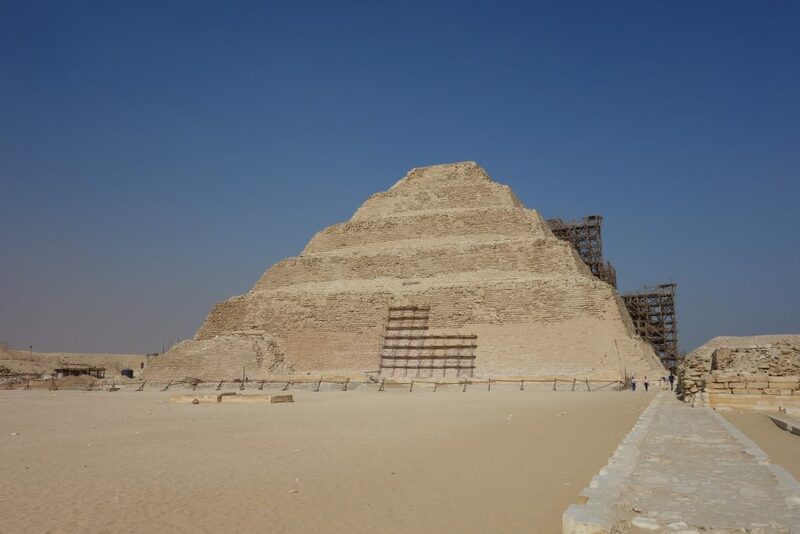 In fact, Egypt holds the only remaining wonder of the ancient world – the Pyramids! 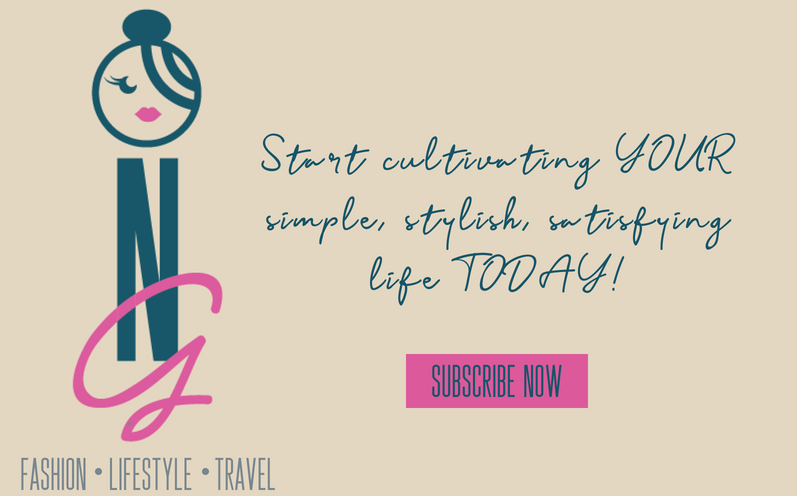 It’s inexpensive and still relatively uncrowded, although 2018 marked their first significant up-spike in tourism in years. The people are about the friendliest, kindest and most welcoming I’ve ever met. It’s safe. Yes, there was a bombing last week that sadly killed 4 people. But every place in the world now has the potential for violence. In fact, more than 10 died due to mass gun violence in various locales throughout the US in December ALONE! All major sights and hotels have extensive security measures in place and we never felt ill at ease during our visit. 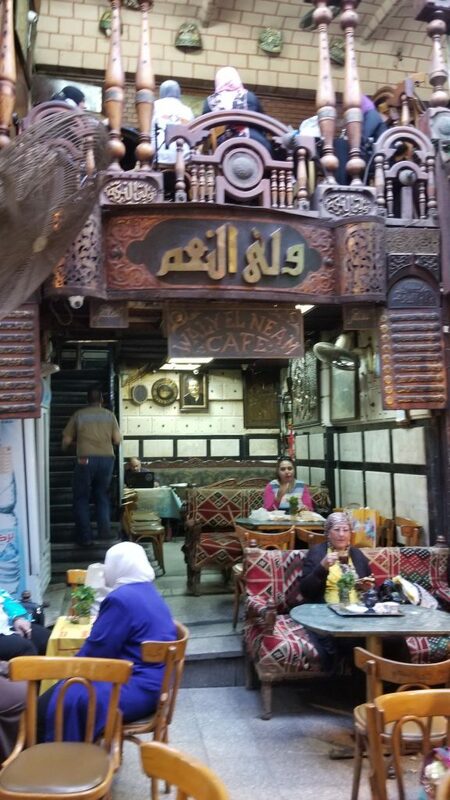 If you want to see ALL the main highlights of Cairo, plan on spending at least 3 days. Four or more will allow you to enjoy all the city’s treasures at a more relaxed pace. Two days can give you a pretty good overview although you will need to pick and choose a bit. 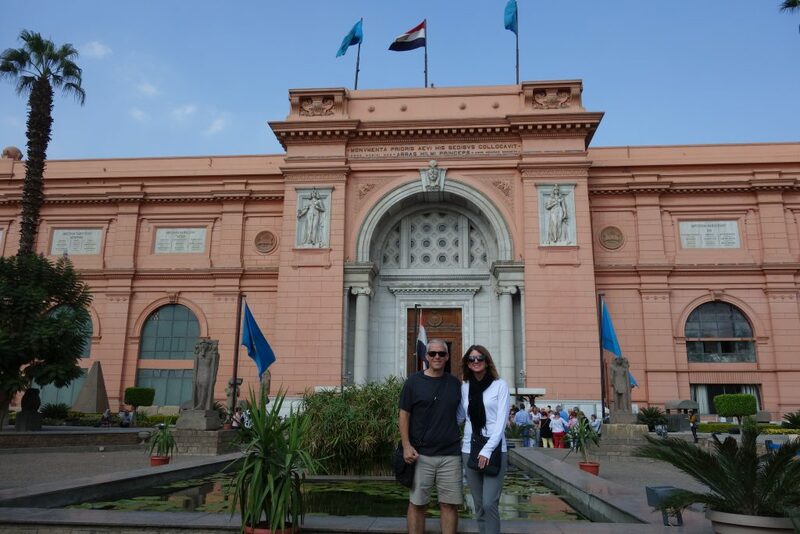 With just one full day, go to Giza in the AM and the Egyptian Museum in the afternoon or vice versa. They are undeniably the top two sights to be seen. 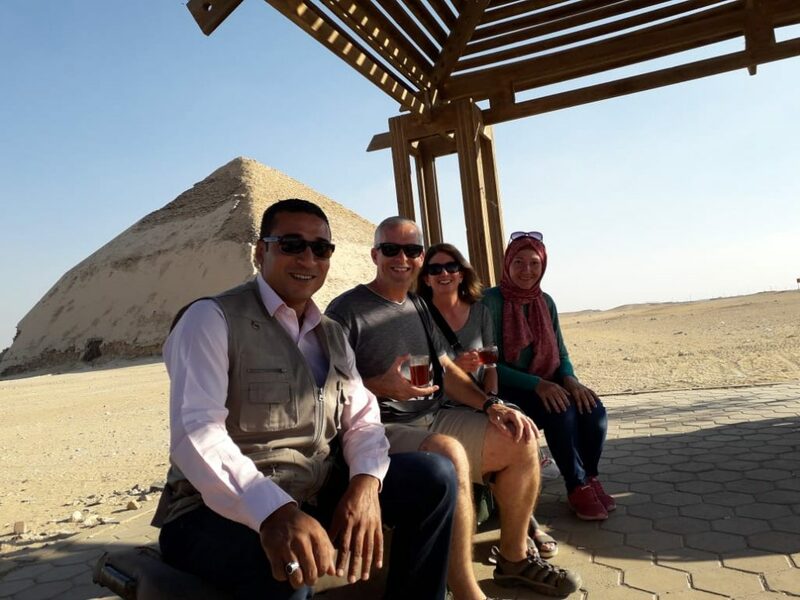 At the very top of a lot of people’s travel bucket list is a trip to the Pyramids and they certainly don’t disappoint! So well preserved and much larger than you’d probably expect. 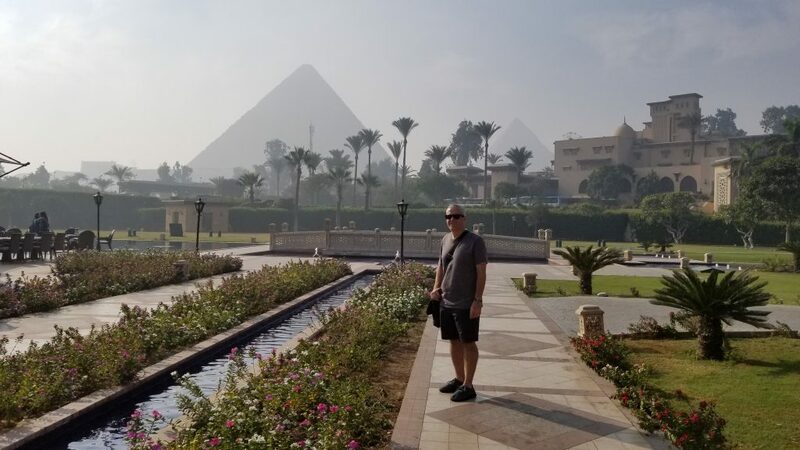 Most everyone stops at the Giza complex of pyramids but the nearby Red, Step and Bent pyramids are equally worthwhile, older and virtually void of tourists. 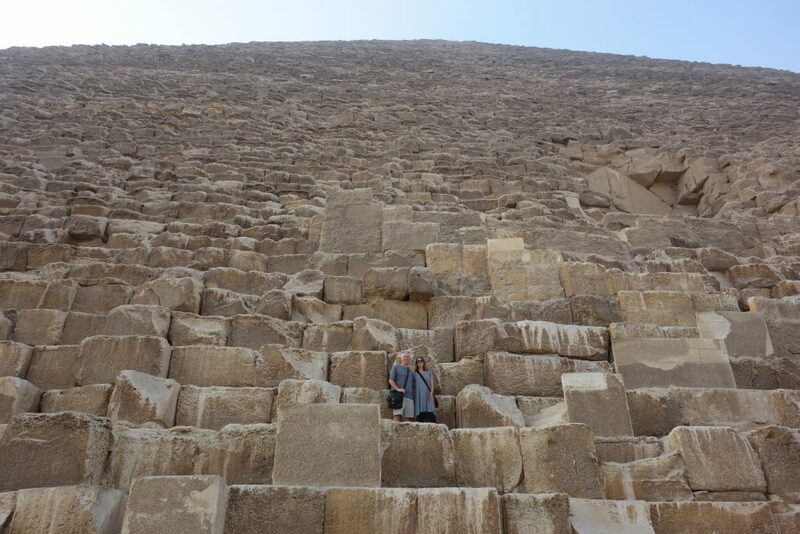 Climbing the great Khufu pyramid at Giza. 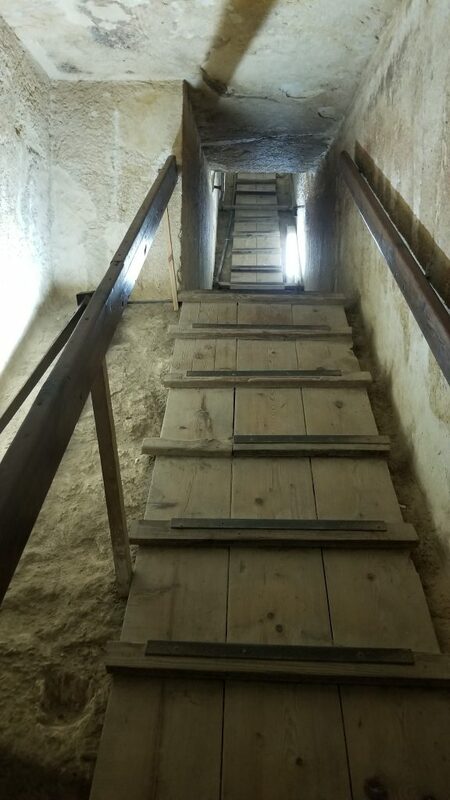 The long, tight and steep steps into the pyramids. 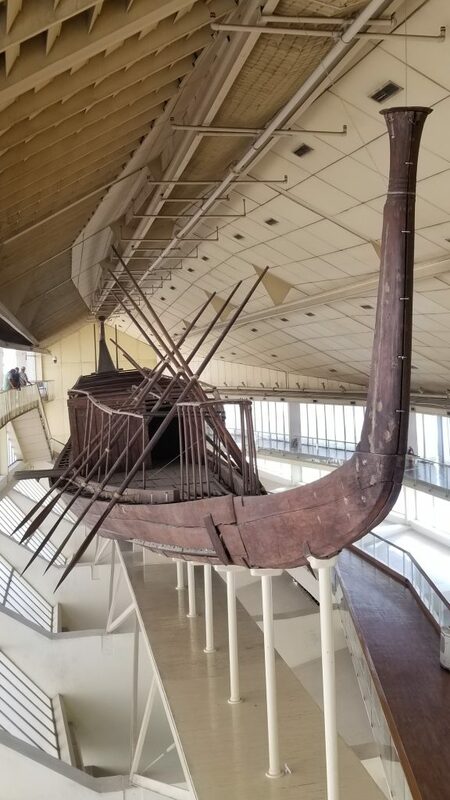 One of the original Sun Boats buried in a pit surrounding the pyramids. 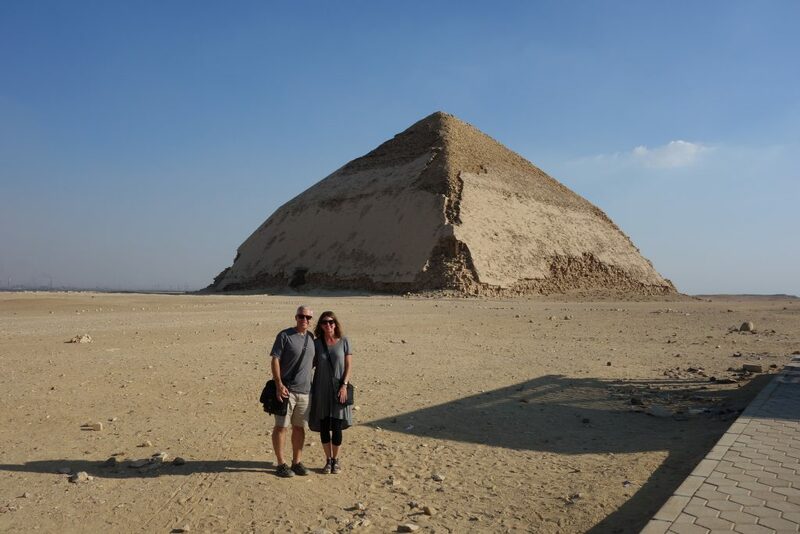 Bent pyramid – the oldest. Enjoying tea with our guide and driver. 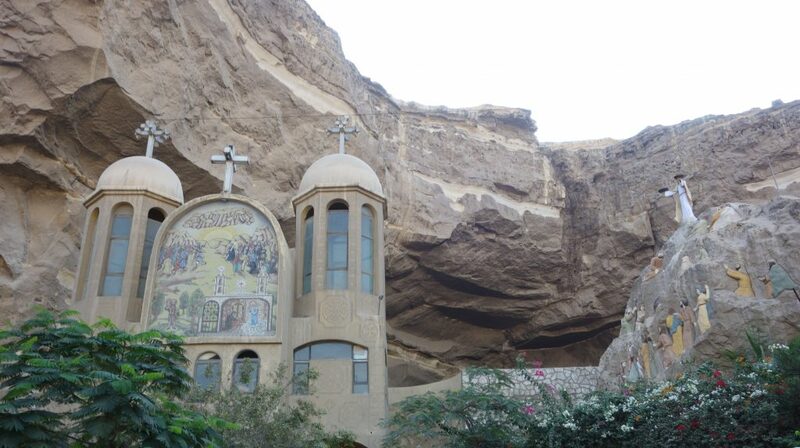 A lesser visited sight, we opted to see the Cave Churches of Cairo. 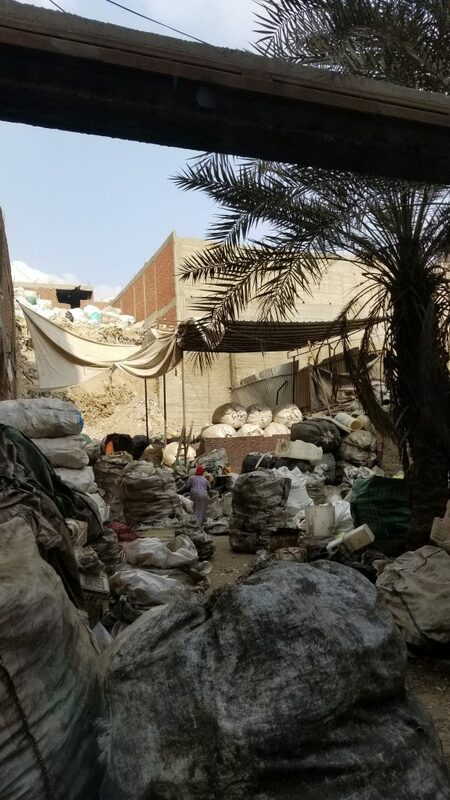 Located at the base of the Mokattam mountains, the residents of the this area are known as Zabbaleen, literally “garbage people”. 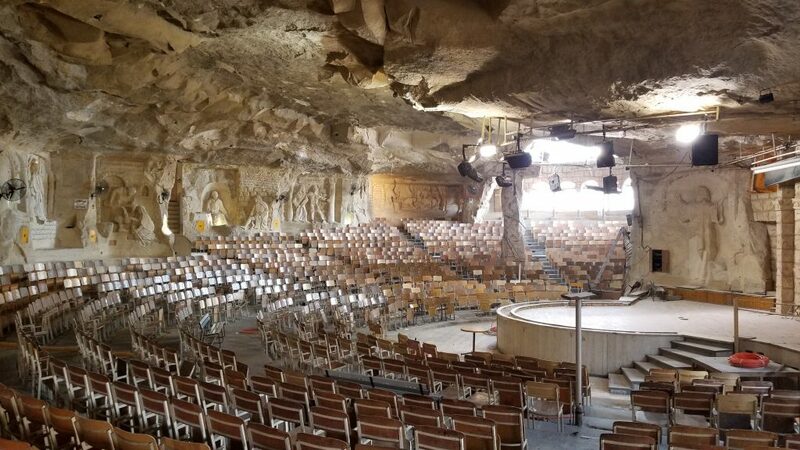 The drive to get to the cave churches is both depressing and fascinating. 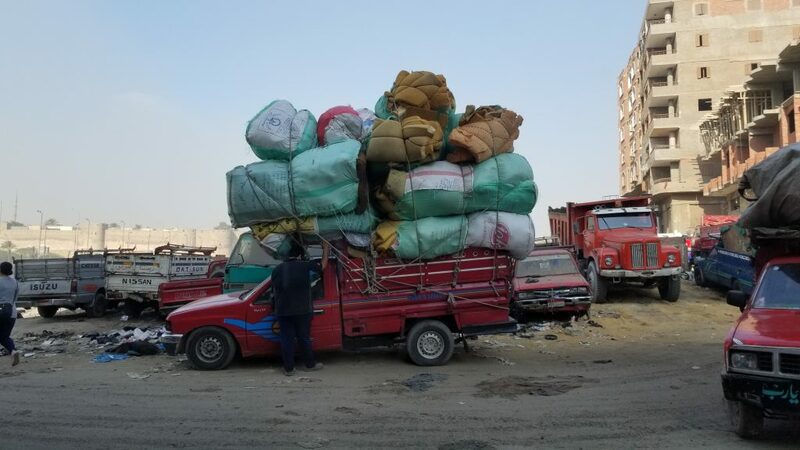 Block upon block is filled with garbage collected from all over Cairo and the people sorting it into recyclables. The churches themselves are incredible. 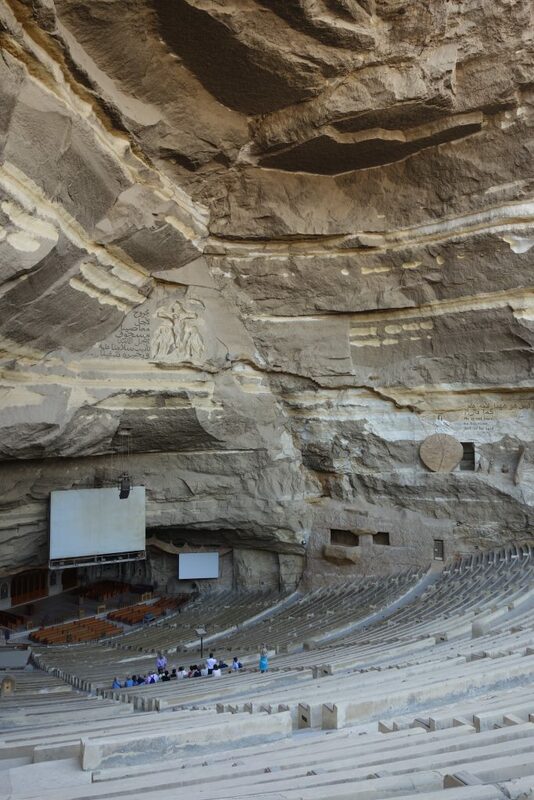 Set into natural recesses within the mountain, the largest holds over 20,000 people. Tahrir Square. Directly across from the entrance to the Egyptian Museum and site of many protests during the 2011 Revolution. 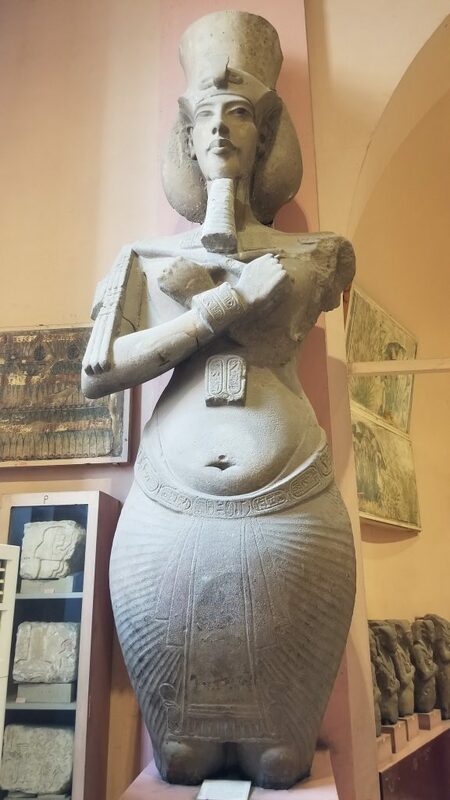 Egyptian Museum. 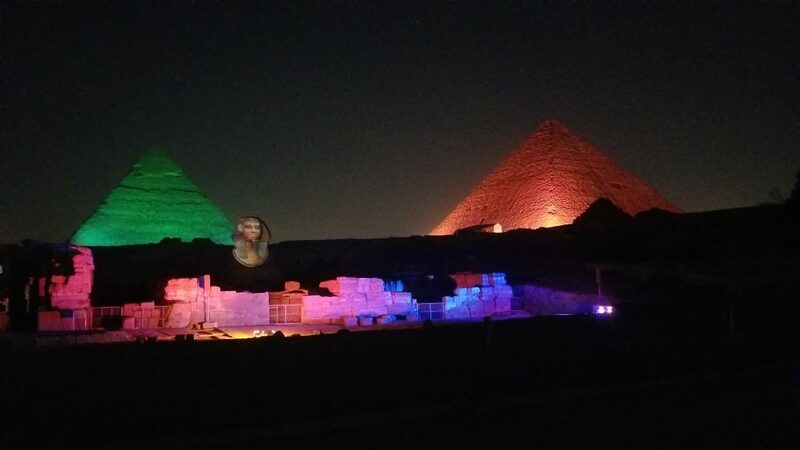 Another must-see on any visit to Egypt. 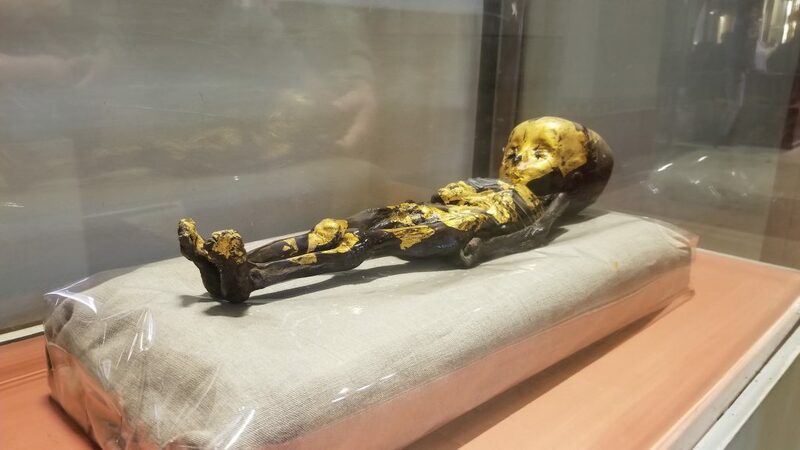 Tut’s Treasures and the Mummy Rooms are not to be missed! 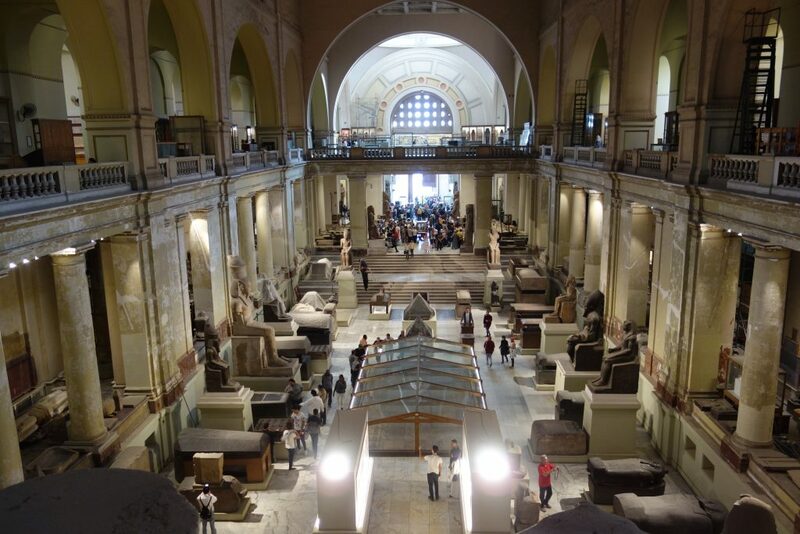 NOTE: The Egyptian Museum is moving to a new location in Giza right near the Pyramids. The new facility is massive (5 times the size of the original) and will have all 5000+ of Tut’s treasures on display. The current museum is in the process of moving items so will not have it’s full collection available. The new museum should be at least partially open in 2019. 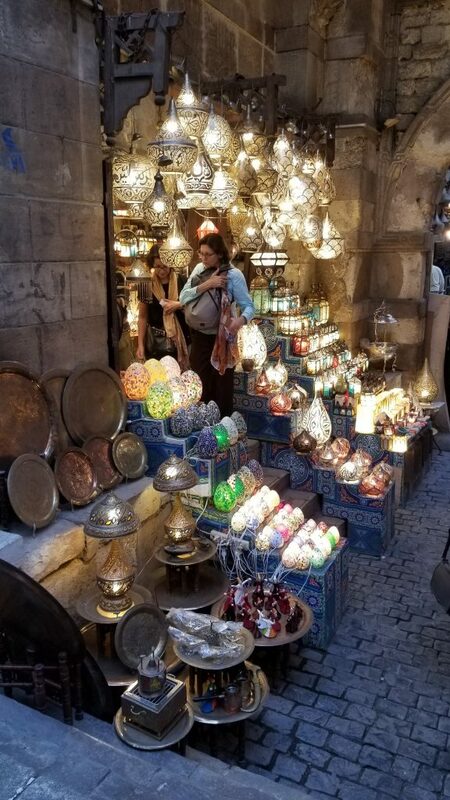 Khan el Khalili Bazaar. Amazing labyrinth of shops, cafes and more! Coptic Cairo. 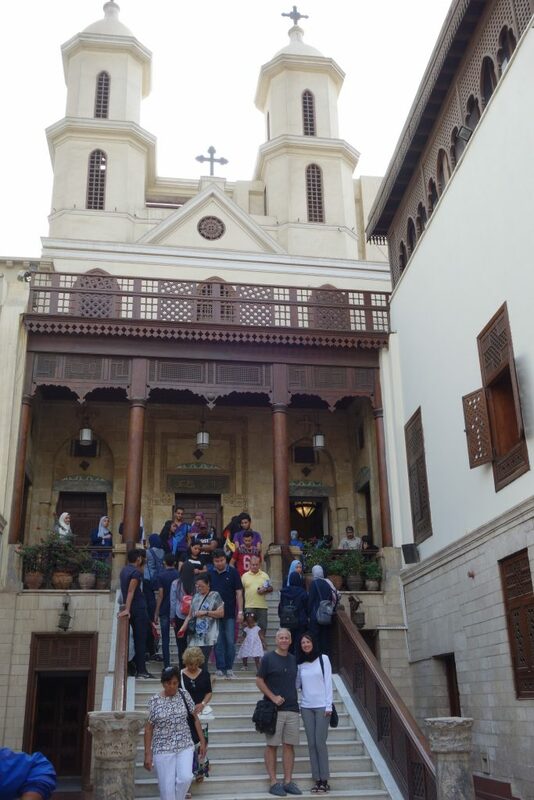 A complex of religious sights including the Hanging Church and the Ben Ezra synagogue. Islamic Cairo. Explore more of the area around the Bazaar. 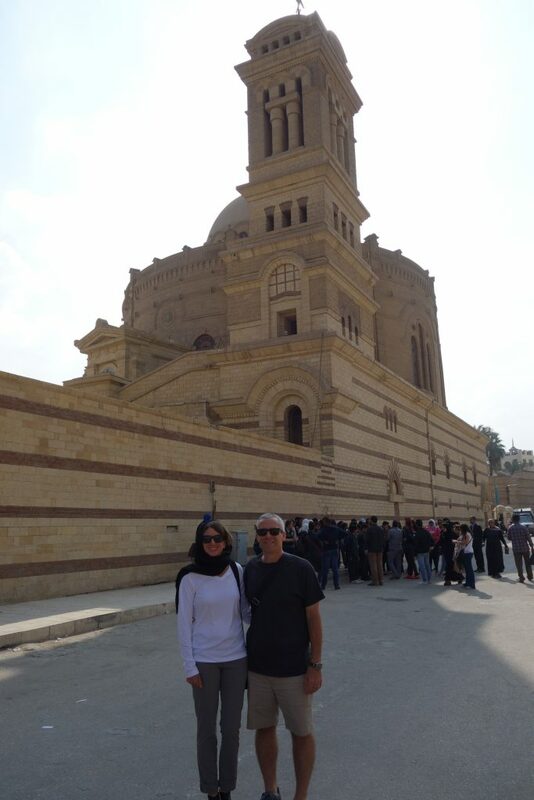 Sights here include the oldest mosque in Cairo (Al-Azhar), the Bab Zuweila tower and viewpoint and Al-Azhar Park. The Street of Tentmakers (part of Islamic Cairo). View the dying art of khayamiya. Saladin Citadel. 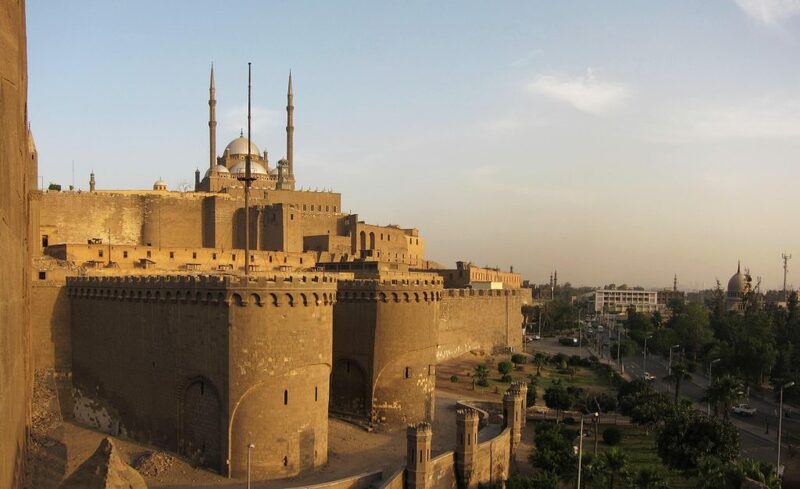 A stately fortress of alabaster that also contains the Mosque of Muhammad Ali (part of Islamic Cairo). 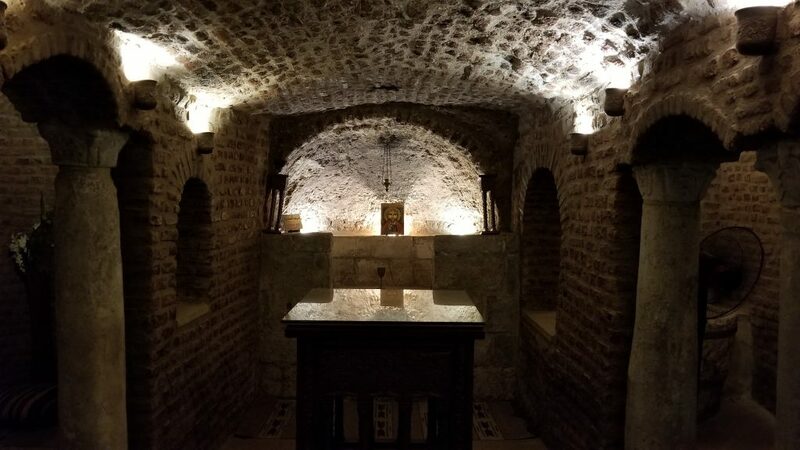 Where the Holy Family are rumored to have hid while they were in Egypt. Cairo is very large, spread out and populated so it can take some time to go from one area to another. Similar to LA but with fewer marked lanes and rules. Oddly, there seem to be no left turns in Egypt. This also adds to the length of time to get anywhere. You may have to go 10 miles down the road to a turnaround and then turn 9.5 miles back to make a right. Funny! We used a driver and guide for our major sightseeing outings and Uber/Kareem for when we headed out by ourselves. Both worked very well. Drink bottled water in Egypt and use caution with food from street vendors. Food in established restaurants and hotels seems fine. We managed to avoid Pharaoh’s Revenge but met several others that weren’t so lucky. Consider carrying this in case it strikes. Poverty in Egypt and Cairo, in particular, is shocking. 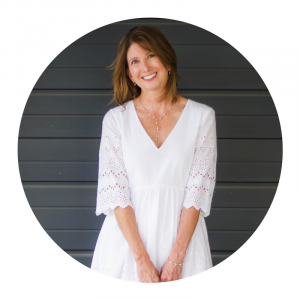 While we had read about it, nothing quite prepares you for it’s overwhelming pervasiveness. Touts. From our online research and chats with others who’ve visited, we were prepared to be assaulted by touts and vendors. This turned out to be a bit over-rated. While we WERE approached, most backed off pretty quickly and told us to enjoy our stay after a quick “la shukran” (no thank you). Baksheesh (small tips) are an integral part of the Egyptian culture. Even other Egyptians are expected to pay, although in lesser amounts. 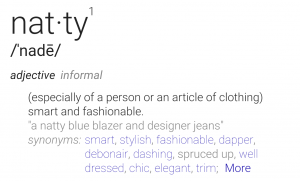 It’s common for any kind of help to be rewarded (giving directions, taking a photo, etc.). Again, we were prepared for the worst and it turned out to be not so bad. Others we met were pretty annoyed by it. Try to keep in mind the amounts of money are quite small to us but can be meaningful to them. There are two primary hotel options best suited for Western travelers in Cairo. 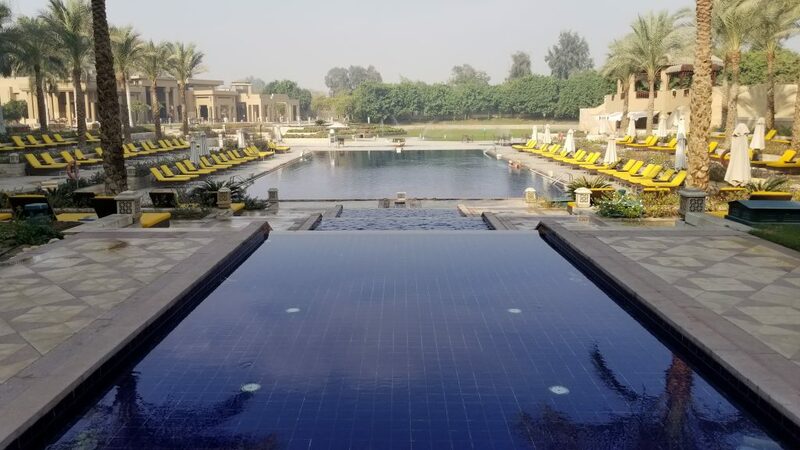 You can stay in the large downtown hotel district, along the Nile and very close to the Egyptian Museum or in Giza, closer to the pyramids. For a four night or longer stay in Cairo, I’d even consider dividing time between hotels in each location. The downtown/river district offers all the major hotel chains: Marriott, Hilton, IHG, Ritz Carlton, Four Seasons, etc. and may offer better access to the nightlife in Zamalek (island district in the middle of the Nile) than Giza. But they are a distance from pyramids and give less of an escape from the madness of downtown Cairo. 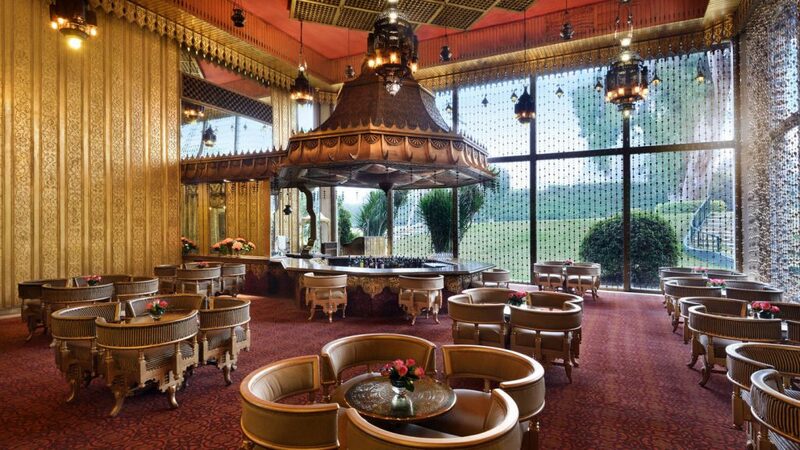 We chose to base ourselves out of the Marriott Mena House. The star feature of the this property is it’s location at the foot of the Giza pyramids. Originally constructed as a hunting lodge in 1869, the Mena House started it’s life as a hotel in 1886. In February 2018, Marriott took over the property and is in the midst of extensive renovations to the historic wing of the hotel. Even high end hotels are pretty inexpensive by Western standards so we just paid for our stay as opposed to using points. Rooms and amenities were typical of a Marriott and there were ample food choices on-site; although oddly the Italian restaurant is only open for lunch. It’s really the grounds and views that you come for when staying here. Nothing is better than breakfast or end-of-day cocktails beside the pyramids and surrounded by lush landscape and water features! Thanks for stopping by! In coming weeks, I’ll cover the other areas of Egypt that we visited: Luxor, Sharm el Sheikh and Abu Simbel. 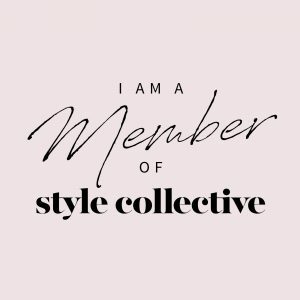 Next Next post: A Happy Wifey OOTD!